Anusha Gupta, PGDM Batch 2016–18, epitomizes the spirit that FORE School of Management, New Delhi encourages in its students. Completing B. Com. (Hons.) from the national capital and after a short industry stint, she didn’t have to look far to pursue her corporate dreams. But Anusha feels she has come a long way since. While there have been many takeaways from the PGDM programme, for her the confidence she has gained remains the vital attribute for future. She had gained a year’s professional experience in audit line with EY when she joined the B-School. 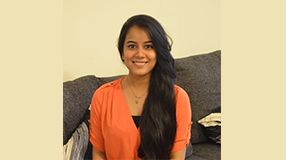 The PGDM training, which included an internship with EY – Knowledge Centre, has catapulted her into the big league. She recently bagged placement with renowned capital market company Darashaw. Here she walks us through her up, up, and away journey. How does it feel on cloud nine after bagging placement with a top brand like Darashaw? I was with my friend when I got the news. My mother was the first person I called. She has pushed me to be the best person I can be. So she was really proud. The magnitude of the placement news hit me when I started getting calls from friends and family. I feel the hard work put in has paid off. Can you tell us a bit about the selection process for Darashaw and how did you win them over? The first round involving group discussion was followed by three rounds of interviews. I felt confident of my abilities and ready to enter the industry. The way I communicated during the interviews helped me bag the placement. After all the presentations during PGDM you become less nervous. I’m not saying I wasn’t nervous before the interview, but I could handle the pressure better. Is this transformation something you had expected when you chose to do MBA? I am a commerce graduate from Delhi University and I worked with EY in the audit service line for a year. But I had my eyes set on the corporate world and a management programme seemed like a natural progression. I knew it would give me an understanding of different industry domains, boost my confidence, and make me more ready for the corporate world. And that’s something you managed to acquire by studying at FORE School of Management? I have been lucky to be surrounded by professors and peers who pushed me to learn the application of concepts and appreciate different perspectives on the same problem. The pressure of these two years teaches you multitasking and people management. It helps you get over your fear of speaking in public. I am more confident of myself, even if it means admitting my flaws. How did your internship experience prepare you for the corporate world? I did my summer internship at EY – Knowledge Centre. At the end of my internship I had a 1.5-hour-long interview with the global director of my team. He asked me a lot of questions related to my internship. That helped me prepare for my interviews. The experience of working in a professional environment also brought many talking points to the interviews. Based on your experience, would you like to share some interview tips with your juniors? Interviewers are not going to ask you to define anything; they want to know how well you understand concepts and how you can apply them. The placement process is testing. It’s easy to get stuck in the rut of thinking what employers are looking for and getting placed first. Instead, figure out the industry you want to work in and the role you are suited for. Now that you have come out of the placement process with flying colours, do you have any immediate goal? I will be working as an analyst with Darashaw. I am expected to know and have an opinion on policies in India and around the world as it will impact my clients’ portfolio. I need to have excellent communication skills to maintain relationships with them. The finance industry is highly competitive, but I am willing to put in hard work to keep learning and growing.